Not only the “big” things, but it’s the everyday, small stuff that’s important too, and so often we tend to overlook it. If you catch a beautiful songbird at your birdbath, you might think “what a magnificent creature” or maybe even ponder the fact that you have two eyes to see it? These are the simple blessings that we take for granted. Anyway… just a thought for the day, wishing you & yours a wonderful Thanksgiving Holiday! Some laws of nature always hold true…cattle dogs and the like are meant to herd, cats are a very curious kind, and well, squirrels are just meant to chew! They’ll try and chew anything where food may be involved, and are especially successful when it comes to wooden bird, or even squirrel feeders. Now the classic Table & Chair Feeder, where the squirrel sits on the chair and eats from the table, has been around for years. But recently it’s been re-invented from sturdy recycled plastics. This material possesses more than good looks, it’s guaranteed never to warp, split, crack, or fade… ever! That guarantee comes from most manufacturers who use the recycled plastics. Aside from the durability, the squirrel feeders, and other products made from it, really do help keep plastics out of landfills. One manufacturer does a traditional bluebird feeder, their recycled products come with a sticker telling you how many plastic milk jugs were used to create the product. That bluebird feeder is made of 33 plastic milk jugs! And part of the beauty is that it still looks new three or four years later. We know because one of those feeders has been in use in our yard for at least four years. A few tips for better squirrel feeding: First and foremost, baffle you bird feeders and deny access by squirrels-it makes life much easier for you and your birds. 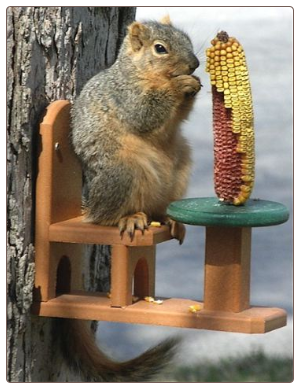 Corn cobs are used in many of the staked-type squirrel feeders, and although they’re relatively inexpensive (if purchased in bulk), Squirrel Logs will last much longer. These are compressed corn, and each one is equal to about 12 ears of the regular stuff. But be sure they are securely attached as our crafty critters have managed to steal them once in a while! Peanut Butter: is a wonderful treat for squirrels during really cold weather. The high fat and protein content provide the extra calories for energy needed to stay warm. We smear peanut butter right on corn cobs, and on the squirrel logs too. You can even make any old tree in your yard a super-feeder by spreading peanut butter right on the bark. Nuthatches, Chickadees and Jays love it too! 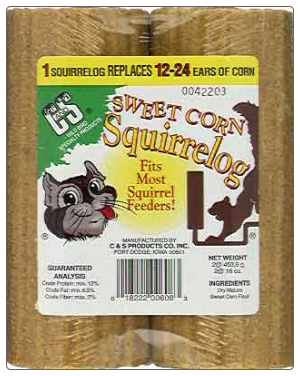 So if you happen to like feeding the squirrels, as many folks do, try some of long lasting Squirrel Logs, buy your corn cobs in bulk from feed & stores, and definitely add some peanut butter for a special treat this winter. … and thanks for feeding the squirrels! It’s deemed the “All Weather Feeder” and rightfully so! An innovative design keeps seed dry- no matter what! 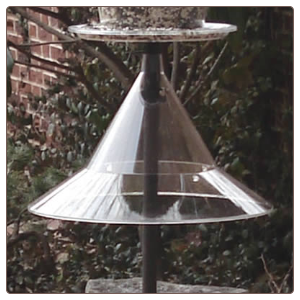 Rain, snow and sleet can not penetrate this durable feeder because unlike a typical tube bird feeder, the seed ports are totally protected from the elements, even from driving, blowing rain. Birds perch on a generous seed tray, and eat seed from above. 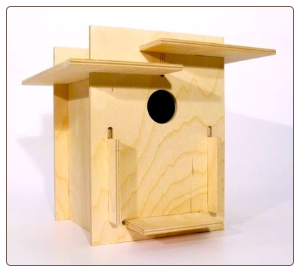 The design consists of a built in weather guard, that overhangs and protects seed ports (and birds too). 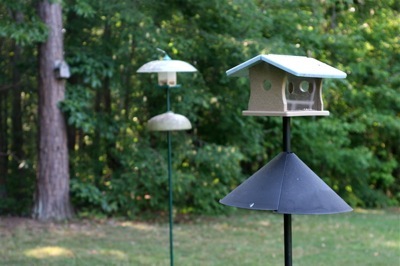 The All-Weather Feeder is available in a four or 6-quart capacity, and may be pole mounted or hung. There’s also an optional squirrel guard, or cage that fits around the open feeding area to keep pesky squirrels out! 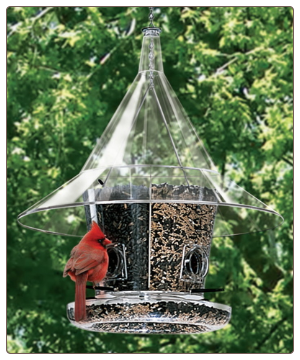 Stainless steel construction along with sturdy polycarbonate casing means this feeder won’t yellow with age either. but there’s still plenty of time win. NEW YORK (November 2, 2011) – More than 10,000 people are looking for birds all over the internet, but perhaps nobody’s more passionate than two recently adopted sisters from Louisiana’s bayou country. The Hall sisters — Siarah, 11, and Savannah, 12 — are Birding the Net as part of Audubon’s innovative social media campaign — and they’re taking their new-found love of birds outdoors as well. Their favorite bird is the Brown Pelican, which swoops across websites just as it glides over coastal waters near their home. But the Hall sisters aren’t the only ones discovering birds through this exciting new project. Audubon is hearing it from many others. Not only are people having fun, but the campaign is delivering on its goal of connecting people to the natural world around them and making them more aware of birdlife in their everyday lives. I’m enjoying the opportunity to meet new like-minded folks and being exposed to new birding Web sites. #birdingthenet has my 3 sons excited about birds. They watch the videos and read their profiles while collecting bird cards. The intro to the amazing variety of birding info on the net has been wonderful. The #birdingthenet Whooping Crane inspired me to see the real thing at the @NationalZoo. A spectacular animal…amazing to see one so close. Birding the Net has taught me about other web sites where I can view birds, and share my love for them. Birding the net has introduced me to other web sites that have a lot of information and perspectives on birds and wildlife. I think I have most enjoyed connecting and helping other birders from all over the country. Certainly there have been some frustrations, but I’ve found others to help me and I, in turn, have helped other people. It’s fun and I don’t have to win to enjoy it. I’ve learned some too, and I am never inclined to complain about something done as a service that costs nothing. The game brings to the Internet the thrill of the chase found in real-world birding, challenging players to spot dozens of species through November 7. Web surfers observe virtual birds doing the same things that birds do outdoors – animations of birds will fly across homepages, perch on mastheads, and flock to birdhouses that anyone can install on personal websites and blogs. Along the way, players will learn more about some of North America’s most engaging bird species, and hopefully acquire a better appreciation for birds in the wild. Clicking on the animated birds on the many participating websites takes players to the Audubon Facebook page to collect and trade “bird cards,” which feature recordings of birdsongs, bird facts, and video. The first players to collect all the birds will win prizes, including a voyage to the Galapagos. All that is required to play is to visit Audubon on Facebook at www.facebook.com/NationalAudubonSociety. Trading bird cards with friends helps a player’s chances of winning; the more Facebook friends that compete in Birding the Net, the more opportunities for trading birds. And for exclusive hints on where to find birds on the Internet, Audubon followers on Twitter (@AudubonSociety) can interact and follow campaign “spokesbirds” @FloridaScrubJay and @RufHummingbird. In addition to the grand prize voyage for two to the Galapagos Islands courtesy of Lindblad Expeditions, prizes include Canon cameras, Nikon binoculars, gift cards to Woolrich and downloads of the Audubon Birds – A Field Guide to North American Birds mobile app from Green Mountain Digital. All 200 winners also receive one-year membership to Audubon.